The International Handel Recording Prize is delighted to congratulate Hyperion upon the award of first prize for its recording of Handel's hitherto neglected The Choice of Hercules. We congratulate the excellent cast of singers, The King's Consort, Robert King, and Hyperion for making such a fine, distinguished, and desperately needed recording. 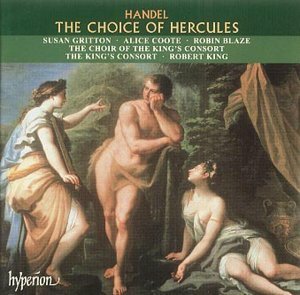 Prior to this recording there were only two old and inadequate versions of The Choice of Hercules despite it being a significant work composed towards the end Handel's distinguished career. Therefore Robert King's performance of The Choice of Hercules is a special and long-awaited contribution to the Handelian discography, and it has brought a previously under-appreciated major work to the attention of many Handel lovers. We particularly wish to acknowledge Robert King's judicious choice of tempos, attractive melodic phrasing, and for his careful attention to aspects beyond the solo singing (such as the sympathetic management of Handel's orchestral and choral writing). The panel also wishes to make special mention of tenor Charles Daniels, who, despite being cast in a minor role, deserves particular praise for his historically-informed and elegant singing. The panel also acknowledges that this superb issue is completed by an excellent essay by Handel scholar Anthony Hicks. We also wish to commend this year's runner-up. We could not ignore the fabulous quality of 'Love Duets' by Suzie LeBlanc, Daniel Taylor, Arion, and Stephen Stubbs. (Read the review.) It is highly unusual for a recital disc to gain so many votes from our specialist panel, not least because 'Love Duets' features so many popular arias that have been so frequently recorded. Yet, in light of the exquisite musicianship featured on this refreshing disc, we congratulate the performers and ATMA Classique, and earnestly hope that they will turn their attention to some substantial Handel recording projects. Gritton (soprano), Coote (mezzo-soprano), Blaze (countertenor), C. Daniels (tenor). The King’s Consort, Robert King. Hyperion. Otter (mezzo-soprano), Dawson (soprano), Saks (bass), Croft (tenor), Daniels (countertenor). Les Musiciens du Louvre, Marc Minkowski. DG Archiv. Macliver (soprano), et al. Cantillation, Orchestra of the Antipodes, Antony Walker. ABC Classics. Bacelli (alto), Randle (tenor), Pushee (countertenor), Norberg-Schulz (soprano), Bonatatibus (mezzo-soprano), Abete (bass). The English Concert, Trevor Pinnock. Avie. Collegium Vocale des Bach-Chores Siegen, Hannoversche Hofkapelle, Trompeten-Consort "Friedemann Immer", Ulrich Stötzel. Hännsler. Rebecca Ryan (soprano), Tallis Chamber Choir. Royal Academy Consort, Jeremy Summerly. Naxos. “Ahi, nelle sorte umane”; “No, di voi non vuo fidarmi”; “Caro autor di mia doglia”; “Quel fior che all'alba ride”; “Conservate, raddoppiate”; “Tanti strali al sen mi scocchi”; “Va, speme infida”; “A miravi io son intento”; “Sono liete, fortunate”. Le Concert d'Astrée, Emmanuelle Haïm. Virgin Veritas. David Hobson (tenor), Sinfonia Australis, Antony Walker. ABC Classics. Emma Matthews (soprano), New Zealand Chamber Orchestra, Donald Armstrong. ArtWorks. Rinaldo ”Scherzano sul tuo volto”, “Cara sposa”, “Lascia ch'io pianga”; Ouverture (HWV 337); Tolomeo “Se il cor ti perde”; Rodelinda “Io t'abbraccio”, “Ombre, piante”; Giulio Cesare in Egitto “Caro! bella!”, “Da tempeste”, Ouverture; Serse “Ombra mai fu”. Suzie LeBlanc (soprano), Daniel Taylor (countertenor), Arion, Stephen Stubbs. ATMA Classique. Suite de pièce in F sharp minor, Vol 1 No 6; Suite de pièce in G minor, Vol 1 No 7; Suite de pièce in F minor, Vol 1 No 8; Suite de pièce in B flat major, Vol 2 No 7; Suite de pièce in G major, Vol 2 No 8; Preludio from Suite de pièce in G major, Vol 2 No 9. Sophie Yates (harpsichord). Chandos Chaconne. Simon Standage (violin), Anthony Robson (oboe), Collegium Musicum 90. Chandos Chaconne. Junge Kantorei, Frankfurt Barockorchester, Joachim Carlos Martini. Naxos. Luca Guglielmi (harpsichord & the Luca Blasi organ, Basilica of San Giovanni Laterano, Rome), Stradivarius. Inc. 8 tunes for Mr. Clay's musical clock; Pieces for a musical clock; 2 Voluntaries; various 18th century organ arrangements of oratorio and choral works. Johannes Geffert (Byfield organ in the parish of St. Mary's, Rotherhithe, London), Querstand.